Scorpio is a proud and special member of the Remount team. Scorpio was bred at Croyden Station by the late Graeme Acton. Scorpio is out of Sereta (by Little Thorn) by Orbiter (by Omega) He is 19 years old and an Australian Stockhorse. 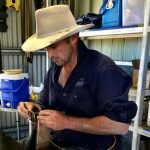 Scorpio came to us in Longreach where he drafted at the Outback Horse and Heritage Expo, competed in team penning, and he also did some of the night shows with Lachie Cosser and his family at the Australian Stockman’s Hall of Fame and Outback Heritage Centre. For many years Scorpio’s career was based around QLD competing in camp drafts, though he nows enjoys his time in the Yass Valley. His current activities include riding down the mountains, attending Military memorial ceremonies, teaching people to muster cattle, and starring at local team penning events. He recently travelled to Camden Haven show to compete in a camp draft and experienced his first visit to the beach which he loved. Scorpio also attends pony club with our daughter who he adores and looks after beautifully.